This middle aged man had severe attrition (wearing) of his teeth. He had a tooth grinding habit (bruxism) which affects 60% of us. He chewed tobacco as a youth and developed many cavities requiring fillings. He also developed gum recession due to the grinding and heavy tooth brushing when trying to remove tobacco stains. 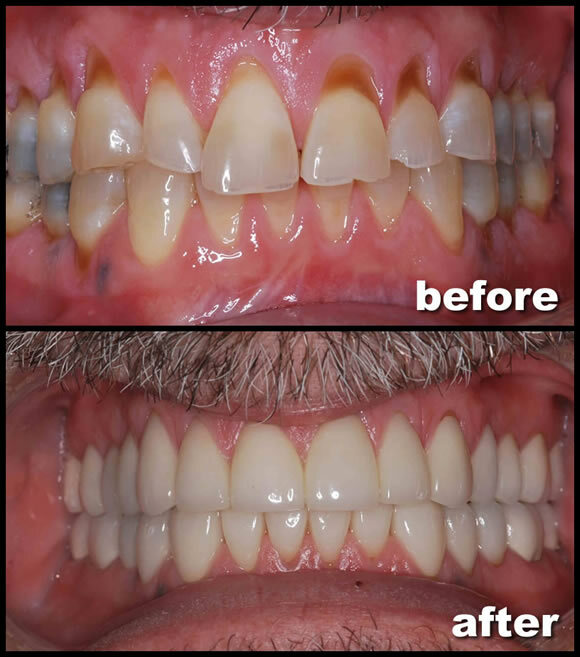 We placed beautiful porcelain crowns to restore the original length and shape of his teeth. We also made an occlusal guard (night guard) to protect his new teeth from future breakage. A night guard is a comfortable, clear retainer to wear at night when most of the grinding takes place. His smile stronger and better looking than ever. And the protection of his night guard will keep it that way for many years to come.